The only live MDS training provider approved by CA BRN & BVNPT! MDS 3.0 Training, Refresher Course or PPS Training for MDS Coordinators & MDS-Involved IDT. MDS Coding Help Hotline: For those who need MDS coding help. 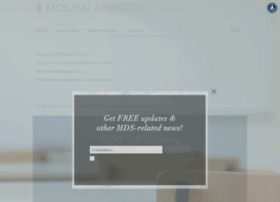 Other MDS classes & MDS seminars available by MDS/RAI Advisor.